Thermoclad is the high density polyurethane foam insulation sandwich panel system, designed for covering and cladding both roofs and walls. 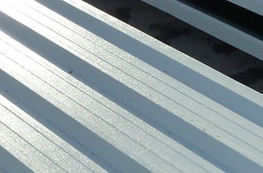 Thermoclad, with highly prominent corrugations, far apart one from the other, has been predominantly designed for building heat insulated roofing and is suitable for small to large projects. The panel stocked at Foregale has a 30mm insulation core, it is polyester paint coated on both sides and is also steel lined! 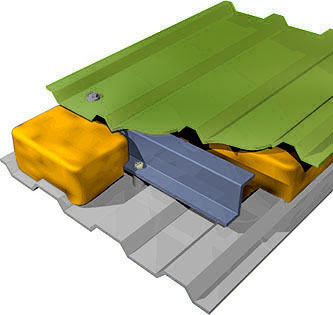 Our unique Thermoclad panels help to reduce rain noise, can be used on low pitch roofs, light weight, dramatically reduce condensation and have coated steel to both inner and outer surfaces. This is perhaps the most commonly used application for insulating an industrial building. The use of the metal outer sheet with its permutation of finishes and colours is complimented internally by using a bright white finished durable metal profiled lining panel. A cavity is formed using a galvanised metal spacer bar to which the outer profile is fixed. This is fixed to the cladding rails with a self-tapping / self-drilling screw and nylon spacer ferrule. The liner panel, also being fixed to the rail, forms the inner skin and the resulting cavity is filled with glass fibre insulation. Increasing the cavity and introducing an air gap has the effect of a further improvement ‘U’ value. It is also possible to use the cladding rail to act as the cavity-forming spacer. The outer sheet and liner panel are fixed to the rail’s internal and external faces and the insulation is achieved using glass fibre and the air gap formed. This has the added advantage of hiding the cladding rails internally. This is an advantage especially in food production areas where the build-up of contaminating items on horizontal surfaces can be avoided. This also allows the inner wall to be cleaned quickly and efficiently. Foregale Ltd was established in 1981 operating from premises on Shillbank Lane, Mirfield. Following rapid expansion, the company not only relocated to the current premises on Union Road, Liversedge but also opened a second depot in Hessle, Hull in 1986. How Will HS2 Impact Leeds?